Society increasingly relies on computer networks in general, and on the Internet in particular. Consumers rely on networks for access to information and services, personal finance and for communication with others. The Internet has become indispensable to the routine operation of businesses and to the global economy. The military depends on network-centric operations and warfare. Governments depend on networks for their daily operation, service delivery and response to natural disaster and terrorist attacks. The consequences to disruption of the network are therefore increasingly severe, and threaten the lives of individuals, the financial health of businesses, and the economic stability and security of nations and the world. With the increasing importance of the Internet, so follows its attractiveness as a target for attackers, whether they be recreational or professional hackers, terrorists or those intent on information warfare. Figure 1: ResiliNets first employs a two-phase strategy D2R2+DR. The first phase D2R2 begins with defence, making the network as resistant as possible to challenges. Inevitably however, a network will be threatened and it must be able to detect this automatically. It will then remediate any damage to minimize the overall impact, and finally will recover as it repairs itself and transitions back to normal operation. 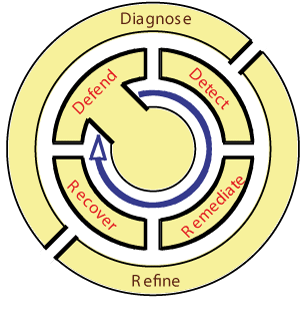 The second longer-term phase DR consists of diagnosing any design flaws that permitted the defences to be penetrated, followed by a refinement of network behaviour to increase its future resilience. From this strategy, we derive a set of design principles leading to resilient networks. Lancaster University in the UK and the University of Kansas in the US are developing new network architectures that regard resilience and survivability as critical to the future of our network infrastructure. The ResiliNets initiative aims to understand and improve the resilience and survivability of computer networks, including the global Internet, PSTN (public switched telephone network), SCADA (supervisory control and data acquisition) networks, mobile ad hoc networks and sensor networks. ResiliNets is an umbrella for a number of projects in resilient future Internet architecture to which we will apply this strategy and principles. These projects are funded by the EU FP7 FIRE (Future Internet Research & Experimentation) programme, as well as the US National Science Foundation (NSF) programmes FIND (Future Internet Design) and GENI (Global Environments for Network Innovation). The ResumeNet project (Resilience and Survivability for Future Networking: Framework, Mechanisms, and Experimental Evaluation) hosts original research work that aims to systematically embed resilience into the future Internet. The project work has three main dimensions. First, at framework level, work will elaborate on the D2R2+DR framework and quantify the impact of different types of challenges and failures on normal network service operation. Metrics, classes of network resilience, policies and ways to negotiate them are at the epicentre. The outcome of this should improve network engineers understanding of resilient network services. Second, the project will look into the mechanisms and algorithms to add to the network infrastructure so that the requirements identified at the framework level can be met. The network infrastructure, both the end-to-end transport infrastructure and the service layer, including servers and data storage equipment, are the subject of work. The focus is on basic functions and technologies that constitute the building blocks of the D2R2+DR framework; nevertheless, some study cases (scenarios) of network service failure are considered in order to exemplify the synthesis of these blocks into a working system. Finally, experimentation takes a leading role, both in terms of resource consumption and significance to the project objectives. Specific scenarios focusing on particular network service provision are composed from failure types and resilience mechanisms. The aim is to demonstrate both the applicability of the systematic approach as it unfolds, and the benefits for several aspects of the network functionality. An equally important task will be to provide feedback on the fine tuning of individual mechanisms in the network. The experimentation facilities will come from in-house test beds and facilities developed by the project. The PoMo (Post-Modern Internet Architecture) project recognizes that the emerging global Internet consists of heterogeneous realms using a variety of technologies (such as optical and wireless) with a number of trust and policy boundaries. In response, we are designing a minimalist Internet working protocol that operates over these realms, and provides strict separation of concerns and inclusion of explicit mechanisms in support of all foreseeable policies that would influence network layer behaviour. The GpENI (Great Plains Environment for Network Innovation) is deploying flexible and programmable network infrastructure to support interdisciplinary research and development of future Internet architectures, as part of the NSF GENI program. GpENI will provide an experimental platform for a number of research projects, including ResumeNet and PoMo.